They want to defend their beloved fatherland. It is in the gene; their parents, grandparents, or even great grandparents were in the army. So they feel it’s time for them to serve the country too. A way to strengthen themselves mentally and physically. It is not any different to any other job options. Obviously, of course, there are significant things that distinguish an army from the other – depending on the country it serves, therefore each army would have different requirements too, naturally. In this article we are going to learn more about the Russian Army. 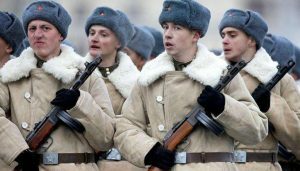 You might be one of the youths having the passion to protect the land, so read on these 4 facts you should know when you decide to join the Russian Army. The Russian Armed Forces were only formed in 1992 after the Soviet Union collapsed. This was done together with the establishment of the Russian Ministry of Defence signed by Boris Yeltsin, the president at that time. This position, the President of Russia, also holds the Commander in Chief degree in the army. This part is mostly similar to all military forces in other parts of the world. The Russian Armed Forces have three branches of forces; the Ground Forces – more familiar with the name Army itself, Aerospace Forces – also known as Air Force, and Navy. From the name of each forces, you can already tell which part of the country goes under each of their protections. For their unique tasks, each forces get their own special trainings. And then, there are troop divisions; the Strategic Missile Troops and Airborne Troops. The Missile Troops handle the control of all Russia’s land-based missiles in case they ever need to be launched. The troops were actually already there since the time of Soviet Armed Forces, only under different name; they used to be called the Strategic Rocket Troops. The Russian Airborne Troops also have a long history back to before World War II. They have paratroopers and handle the airborne operations. The further divisions of the Russian Army are separated into the Logistical Support, National Guard, and Border Service. The last two are separated from the Ground Forces because they operate under different ministry. Since 2010, two of the Russian military forces – the Ground and Air – are spread into four military districts; Western, Southern, Central, and Eastern. Before that year, from the beginning of the establishment of the Russian Armed Forces in 1992 until 2010, the districts were spread around Moscow, Leningrad, North Caucausian, Privolzhsk-Ural, Siberian and Far East. The Navy has their own areas to cover; Baltic, Black Sea, Caspian, and Pacific. Considering the size of the country (17,125,200 square kilometres), Russia has a very large land to protect and defend. This explains why the country owns one of the largest military forces in the world and holds the title of being the second most powerful military forces in the world. In Russia, conscription is still put to use. It is a mandatory military service for all male citizens of Russia age 18 to 27 for 12 months. In 1997 to 1998 the service time was up to two years, but it immediately got cut down. The conscription, though, gives exceptions for them who are still students, holding the degree of Ph.D. , a parent of at least two children, a sole caretaker of a sick or disable family member, and who are sons or brothers of soldiers who got killed or disabled during the military service. The citizens who don’t belong in the exceptional group but refuse to serve the military are considered violating the law and would be imprisoned for 2 years. The Russian military services are divided into four; conscription, contract, alternative, and state civilian. Because the conscription is mandatory, citizens who are eligible don’t need to apply. However, if they want to continue with the contract, they have to meet several requirements to see if they fit for the real military services. When applicants don’t meet some of the requirements but still considered able to serve, they will be offered the alternative and state civilian services. Everyone who needs information about the application can go ahead and visit the Ministry of Defence of the Russian Federation website to contact the officers in charge. Applicants will go through several steps of tests starting from filling forms all the way to medical examinations and in-depth selection. This is like sifting the best from the best to join the forces. Above anything else, an applicant should be sure that he or she is a good citizen with a clean record before considering to apply. But, the Ministry of Defence of the Russian Federation also open their doors to foreigners who are still part of the Commonwealth of Independent States to join the contract service. So, after going through the 4 facts you should know when you decide to join the Russian Army, do you think you have what it takes to be a part of their military forces? Surely it takes more than just a physical fitness to serve such a big nation but also a great mental strength and a pure love for the fatherland that you mean to protect and serve.